In my last blog post, I wrote about Redbad, a Frisian king almost lost to history, who resisted Frankish occupation against overwhelming odds. Since his story was obscured by the Catholic church that opposed his pagan faith, not much is known about him. The most remembered story about him in popular culture is how at the last minute, standing in the water in which he was to be forcibly baptized, he resisted conversion. The legend is that it was not because he was steeped in his own Pagan beliefs, but rather because he objected to any subjugation. He believed in freewill. There is no historical verification of this act of defiance, but it makes for a fantastic story. This notion of freewill is not original to Redbad. As a matter of fact, it is a recurring theme in tales dating back thousands of years. Being at odds with a centralized religion or government, is now a founding principle of Western socio-political thought and it influences most areas of life, from the highest levels of government down to everyday lives. The suggestion that this is a legend rather than historical fact risks undermining the whole of Western ideology, so writers and thinkers have tended to blur the lines between history and legend. 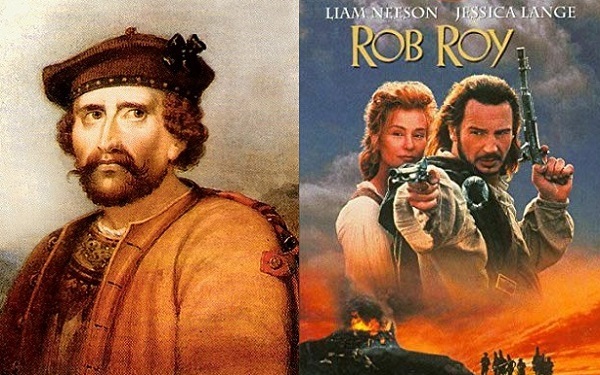 The historic Rob Roy MacGregor (left), and the Hollywood film, starring Liam Neeson as the legendary Rob Roy (right). Last night, our family watched another history-inspired film: Rob Roy, which is very loosely based on the life of Robert Roy MacGregor (1671–1734). MacGregor took part in the Jacobite uprisings in Scotland in support of the Catholic king James II who had been deposed. As with Redbad, much of the story is better remembered as legend and cannot be completely verified. The movie actually focuses on a lesser event later in MacGregor’s life regarding a loan that he could not repay. In so doing it over-moralizes the life of a man who perhaps was not as noble or historically significant, in his own time. The generation of our children, who will find the answer to any historical reference at the touch of a screen, needs more enticement to learn from history. They need more legendary tale-telling. Their expectation is of Marvel heroes that save the entire universe in a span of a 2-hour blockbuster movie. They are enthralled by YouTube sensations who earn thousands of dollars making (often ridiculous) videos. A little fantasy and legend loosely based in actual events in our history, is necessary. What is more important than the debate of what is historical and what isn’t, is the question about what this tells us about who we are. When novelists, authors and historians write about these events, with all their a-historical warts, they bring out those elements that they believe matter most. This gives us a glimpse of what matters in the our own time. Even if that consideration is largely a financial one (it sells more tickets at the box-office), it is still a measure of what matters most. At the risk of cynically suggesting that what sells matters most, we should still consider our place in this. As leaders, we need to be fully aware, not just of the negative aspects of what this means, but also that there is some redeeming quality to it all. In the end, a new story with some basis in history is being shared and it raises interest in that story. For example, watching Rob Roy last night started a whole new interest for us. I’m not particularly fond of British history, but I just finished reading large sections on the Jacobite Rebellion in Norman Davies’ A History of Europe. As it turns out, Rob Roy is just a small sliver of the larger international events of the time, but it is through his story that these events elicited my interest. The movie isn’t very historical and the legend is overblown, but without them I would not have learned about them. As business leaders we need to understand that sometimes a little legend is necessary to induce otherwise uninterested parties to become interested. For example, entrepreneurs typically complain that building a business is a tremendous amount of work, that it requires extreme sacrifices and that few survive to financial solvency. Let’s turn that around. If success is so dependent on being unique, why not display the opposite message? The new message can be that building a business is actually not unreasonably difficult. Voilà, a new legend is born. There is another way this approach matters. Most entrepreneurs are so focused on making ends meet that they work themselves to the bone and is little else of interest to them. Why not add a little legend, romance and intrigue to one’s persona? There are many ways to do this, but here is the most basic one: most Americans are immigrants, so why not weave that into one’s persona? It adds a sense of mystery and exclusiveness, but also a sense of history, internationalism and ancestry. For example, when I found out that Steve Jobs was of Syrian descent, I immediately searched out more info about him. For me, it added the story of a man I previously thought was just a computer nerd who had been extremely lucky. Now this man had a whole new side to him that I had never considered. Additionally, I learned a bit about Syria, about immigration, and America’s relationship with the country that I hardly knew before. Another important factor is that in leadership, it matters to do honorable things. To quote the Rob Roy movie: “All men with honor are kings. But not all kings have honor.” Finding honorable things to do may take some thought and these things may be very small. Perhaps it requires pulling a thoughtful quote from a presentation that you made. Another idea is to share the charitable work you are involved in. Another way is being recognized for the way you treat your employees or clients. These could be small acts, but taken together, they establish an honorable presence. Honorable acts should not be invented, mis-represented, or done just for the sake of being noticed; they should just be genuine and intentional. The importance is less about the act itself, but rather how others perceive it, and how they write, talk and represent it. Sometimes, that tale will be entirely self-serving on the part of others, but that doesn’t matter. How it is remembered is something over which you have no control, but if you regularly do honorable things, eventually these will be noted, remembered, and shared. This was the case for Redbad as well as MacGregor. Of course, taking larger and greater actions are even more impactful, but those should occur after it is established that they are rooted in the smaller, honorable ones that preceded them. Perhaps one day, you have the opportunity to stand up against an injustice in a very public forum. If this occurs after you have already established yourself as an effortlessly successful, legacy-worthy individual who regularly behaves honorably, then committing to a greater act of courage will be seen as following in an honorable tradition. It will serve to multiply the impact of your story. It will create a persona that others will want to follow, emulate, and be associated with. It goes without saying that the most important part of this is to be consistent. For example, if you decide to champion the rights of animals, then you must do so in everything that you do, consistently, and with genuine interest. Doing so shows to those who follow you, that they can expect more of the same from you in the future. It also has other psychological benefits. One of my favorite quotes from Ralph Waldo Emerson is: “Consistency is the hobgoblin of little minds.” In other words, consistency also suggests greatness of mind and spirit; it suggests social intelligence. Combined, all these actions create not just legend-like leadership, but they are also invariably tied to success, for yourself, but also by association for your business. People gravitate towards tangible evidence of success, but more importantly, they gravitate towards intangible measures as well. This is because they perceive these to be even greater. They become stories, legends, and legacies. Building them is really just a matter of realizing that they grow from small incremental steps, the first of which seem trivial and simple, but that build upon themselves over time. How do we know what those are? Well, by learning from the examples of those who came before us. Writers, artists, and film makers have shown us how the actions of historical figures mattered most, now we just need to look up from our busy lives and take notice. This blog post was simultaneously published in The Gigster 'Zine, a newsletter published by the Colégas Group discussing new and innovative part-time opportunities & success strategies for anyone with a college degree. To sign up for the newsletter, click here.